11th lunar month of 1804: he makes his first appearance on stage at the Nakamuraza, where he receives the name of Iwai Hisajirô I while his father takes the name of Iwai Hanshirô V.
11th lunar month of 1812: Hisajirô takes the name of Iwai Kumesaburô II at the Ichimuraza. 3rd lunar month of 1814: premiere at the Ichimuraza of Tsuruya Nanboku IV's drama "Sumidagawa Hana no Goshozome", commonly called "Onna Seigen"; Kumesaburô plays the roles of the okujochû Taketawa and Kariganeya's shinzô Uneme [more details]. 5th lunar month of 1815: premiere at the Ichimuraza of Sakurada Jisuke II's Kiyomoto-based dance-drama "Imayô Suma no Utsushie" (commonly called "Suma no Utsushie"); Kumesaburô plays the role of the ama Murasame [casting]. 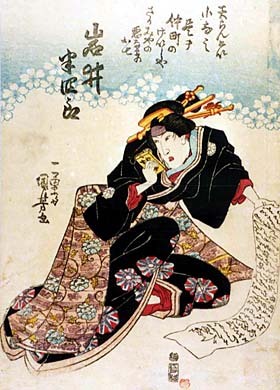 9th lunar month of 1819: first adaptation to Kabuki (in ôshibai!) of the drama "Seishû Akogi-ga-Ura"; Kumesaburô plays the role of Heiji's wife Oharu [casting]. 11th lunar month of 1822 ~ 10th lunar month of 1823: the best year of the Iwai Clan; The tateonnagata for the 3 Edo theaters (Edo Sanza) are Iwai Hanshirô V (Ichimuraza), Kumesaburô (Nakamuraza) and Iwai Shijaku I (Moritaza). 7th lunar month of 1825: Kumesaburô plays at the Nakamuraza the roles of Okaru, Oishi and Osono in the drama "Kanadehon Chûshingura". 7th lunar month of 1825: premiere at the Nakamuraza of Tsuruya Nanboku IV's ghost play "Tôkaidô Yotsuya Kaidan"; Kumesaburô plays the role of Osode [casting]. 9th lunar month of 1825: premiere at the Nakamuraza of Tsuruya Nanboku IV's drama "Kamikakete Sango Taisetsu"; Kumesaburô plays the roles of Dakki no Koman, Oroku, Moronô's mistress Ran-no-Kata and Kanpei's widow Okaru [casting]. 6th lunar month of 1827: premiere at the Kawarasakiza of Tsuruya Nanboku IV's drama "Hitori Tabi Gojûsan Tsugi"; Kumesaburô plays the roles of Ôe's daughter Princess Shigenoi (later the hinin Koman), the keisei Komurasaki and Minbunosuke's wife Onobu [casting]. 9th lunar month of 1827: Kumesaburô plays at the Ichimuraza the role of Otoku in the drama "Keisei Hangonkô"; his stage partners are Ichikawa Danjûrô VII (Matahei), Ichimura Uzaemon XII (Utanosuke), Ichimura Uzaemon XII (Shurinosuke) and Kataoka Nizaemon VII (Shôgen). 3rd lunar month of 1831: premiere at the Nakamuraza of the five-role hengemono "Rokkasen Sugata no Irodori"; Kumesaburô plays the role of Ono no Komachi [more details]. 11th lunar month of 1832: great shûmei for the Iwai clan at the Nakamuraza; Iwai Hanshirô V, Iwai Kumesaburô II and Iwai Hisajirô II respectively take the names of Iwai Tojaku, Iwai Hanshirô VI and Iwai Kumesaburô III. They play together in Segawa Jokô II's drama "Goban Tadanobu Yuki no Kuroshiro" and their stage partners are Matsumoto Kôshirô V, Nakamura Shikan II, Ichikawa Yaozô IV and Sawamura Tosshô I. 2nd lunar month of 1836: Hanshirô appears on stage for the last time, playing at the Moritaza 15 roles in the drama "Sugawara-ryû Kanagaki Soga", which mixes the "Sugawara Denju Tenarai Kagami", "Kanadehon Chûshingura" and sogamono worlds. He suddenly falls ill in the middle of the month and dies the 8th day of the 4th lunar month of 1836. His tombstone is located in the cemetery of the Jôshinji temple in the district of Fukagawa. Iwai Hanshirô VI was a talented wakaonnagata, who achieved fame for himself in Edo during the first half of the nineteenth century. His popularity was high (as high as the one of Segawa Kikunojô V in the 1820s) but he unfortunately died too young, before reaching the peak of his career. As far as art is concerned, he followed the same path as his father Iwai Tojaku or his grandfather Iwai Hanshirô IV but he did not create his own.